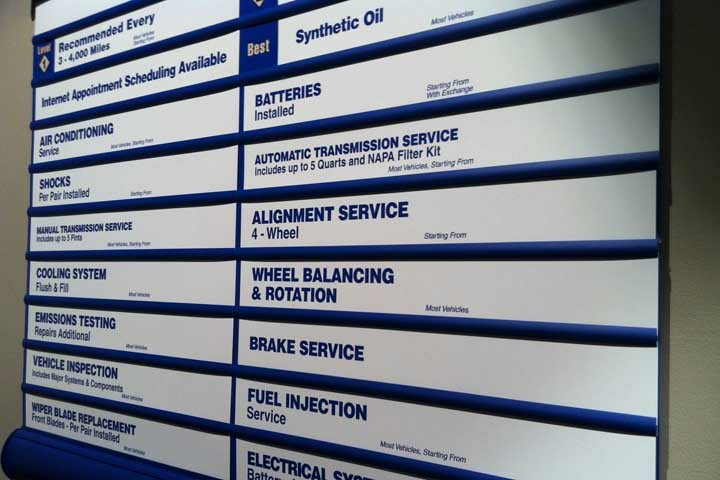 Ohio service centers have a menu board that lists the services they provide. Some Whitehall drivers may not be familiar with all of the items on the board so here is a quick description of some of the typical services that might be listed. Tuffy Tire & Auto Service Whitehall fuel system cleaning: Over time, the vehicle fuel system gets gum and varnish built up. A fuel system cleaning gets rid of that and cleans out the fuel injectors. Saves gas, by the way. Tuffy Tire & Auto Service Whitehall headlamp replacement: Halogen and standard headlamps gradually fade. It's usually good to change them every year or so. Tuffy Tire & Auto Service Whitehall inspections: Whitehall drivers get inspections for many reasons. Maybe they're going on a trip or just want to make sure their vehicle's ready for a Ohio summer or winter. Maybe they just bought a used vehicle and want to give it the once over. An inspection may reveal some things that are broken or are getting close to having a problem. Tuffy Tire & Auto Service Whitehall oil change: There are several options: Some Whitehall centers offer just an oil change and new filter as an option. Most will also check and top off all of your other fluids and do a quick visual inspection with a full service oil change. In my way of thinking, the full service option is best because it makes sure you have adequate fluids and may uncover an emerging problem. There may also be options for higher mileage fluids or an upgrade to synthetic oil. Tuffy Tire & Auto Service Whitehall PCV valve replacement in Whitehall: PCV stands for Positive Crankcase Ventilation valve. It's a little part that releases pressure from the engine. It can get gummed up and that can lead to engine damage. It just needs to be changed now and then. Tuffy Tire & Auto Service Whitehall power steering service: Often overlooked. Your friendly and knowledgeable Tuffy Tire & Auto Service Whitehall technician will evacuate the old fluid, clean out the system and replace it with clean fluid. Keeps the vehicle system running well for a long time. Tuffy Tire & Auto Service Whitehall serpentine belt service: That's the belt that powers the vehicle engine's accessories like the alternator, air conditioner, power steering and brakes. You'll want to replace the serpentine belt before it breaks, because that'll shut you down. Tuffy Tire & Auto Service Whitehall shocks and struts: This starts with an inspection of the suspension components. Shocks last a long time and wear out slowly, so many Whitehall drivers don't notice when it's time to change them. If they're worn or leaking, they need to be replaced. Tuffy Tire & Auto Service Whitehall transmission service: This involves removing the transmission fluid and replacing it with clean fluid. It's like an oil change for your transmission. Tuffy Tire & Auto Service Whitehall tire rotation and wheel balancing: The tires are rotated from front to back using the recommended rotation pattern. This helps tires wear more evenly. Wheels need to be balanced from time to time to keep them turning without any wobble or bounce. Helps the ride and saves tire wear.